Snoring is loud breathing during sleep that sounds like unpleasant rattling, vibrating, or sawing and can cause havoc with people nearby. At the most basic level, snoring occurs in some people because the muscles in the body relax during sleep, allowing these structures to vibrate as air flows by them. When people are awake, these muscles are active, and the structures are much less likely to vibrate during breathing. The causes of snoring are similar to those that cause a more-serious condition called obstructive sleep apnea. 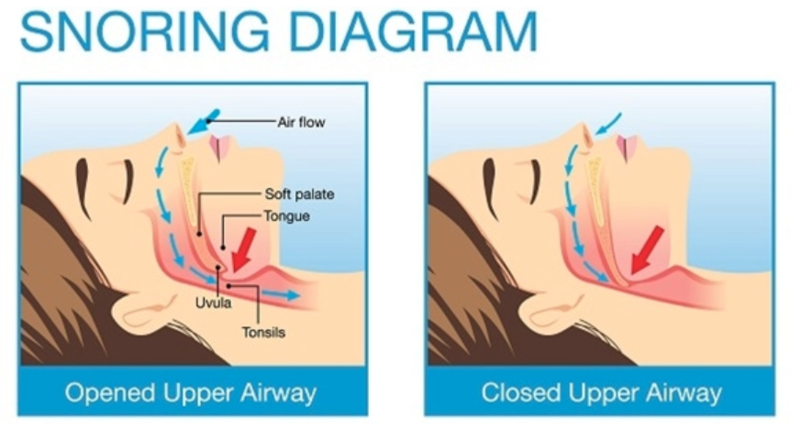 The difference between the two is that sleep apnea involves blockage of breathing at night. Snoring is not the same as sleep apnea, although the terms are sometimes confused. About half of people with snoring issues that regularly wakes up other people will have obstructive sleep apnea. Obstructive sleep apnea is a condition involving temporary breathing interruptions during sleep. These breathing pauses can lower blood oxygen levels and allow carbon dioxide to build up in the body. Snoring can be a precursor to apnea and if there is ever a concern, the advice of a medical professional should be sought. Around 45% of adult men and 30% of women snore regularly. Certain physical attributes can make snoring more likely. Snoring is more common in men than women, and carrying excess body weight increases the risk of snoring. One in three women snore during pregnancy, due to increased body weight, hormone fluctuations, increased pressure on the diaphragm and swelling of the nasal passages. Babies and newborns snore due to small nasal passages, though this is usually outgrown. Unfortunately you are generally sound asleep while other struggle with your affliction. The best way to remedy non-medical snoring habits is to understand exactly what is happening. This is where we come in! Hupnos monitors your position and listens for snoring. Hupnos will gently vibrate so you move positions or will change your exhalation pressure so you stop snoring. Most importantly Hupnos will analyze and track your sleep results and find which factors hurt and which remedies help you to sleep perfectly allowing you to restore peace in your bedroom!